While most of the basketball world is looking forward to the FIBA World Cup taking place in Spain in a couple of weeks, the NBA is still moving forward to the start of their new season. It may be the off season in the NBA but there are still plenty of breaking stories and gossip to enjoy from the biggest basketball league in the world. There are even some times that the biggest basketball stories come from the fans of the game, as opposed to the players. 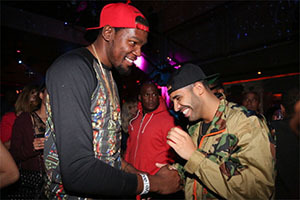 Rapper Drake is a big sports fan and his wooing of Kevin Durant has led to the Toronto Rappers being fined $25,000 by the NBA. This is because the league deemed that a shout-out given by Drake during on his concerts was akin to tapping up the player. The league has very serious rules with respect to tampering and as Drake is recognised as a global ambassador of the Raptors, the league decided that he was acting in some of an official capacity. Durant has been in the news because of his withdrawal from the FIBA World Cup, which may impact on your Basketball World Cup betting strategy, but it is obvious that this is a basketball player that finds himself in the news all the time. I just want to show one of my brothers something. You know, my brother Kevin Durant was kind enough to come to the show tonight and watch us. I just want him to see what would happen if he came to play in Toronto. Let him know what would happen. The crowd then roared their approval with chants of “KD! KD!” filling the arena. Drake played a key role in convincing English international striker Jermain Defoe to come to Toronto to play in the MLS, so it is clear that he is a performer that loves a wide range of sports. It is important to note that Durant is still under contract with the Oklahoma City Thunder and that this contract still has two seasons to run. While Toronto shows an interest in the player, they are unlikely to be the only team interested in snapping up Durant if and when he becomes available. It has been noted that teams like the Los Angeles Lakers, the Brooklyn Nets, the Washington Wizards and the New York Knicks would be all interested in taking the player as a free agent in 2016. There will be some people who believe that this sort of punishment and excessive, but unfortunately, if the Raptors are going to benefit from the exposure that Drake will bring them, they will also suffer at times if he oversteps the mark. There is no doubt that many fans in the arena watching the concert would have loved the action, no doubt helping Drake to further boost his popularity in the local area, but it may be that the Raptors will need to have words with the star. This is the sort of behaviour that can cause a team problems and if there is a repeat of the actions, there could be larger punishments to follow. Even when we are months away from the first NBA match of the season, the leading basketball league in the world still manages to throw up some crazy stories that get the sporting world talking. When it comes to grabbing attention, the NBA remains the number one show in town.